Not long ago I shared my experience with the ROCCAT Horde AIMO “membranical” keyboard. 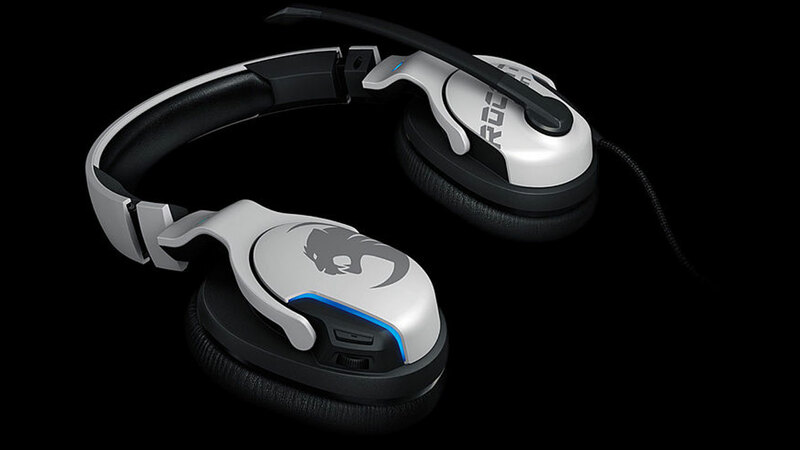 This time around, I’m looking at the matching ROCCAT Khan AIMO headset. 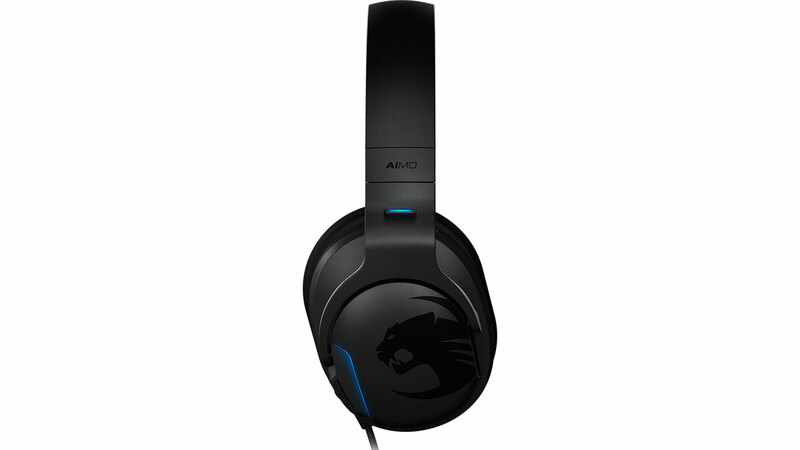 As you’ve probably guessed by now, this headset works in tandem with all the other AIMO products ROCCAT offers, even though they aren’t sold as one complete set. If you do happen to purchase any of the AIMO peripherals, I’d suggest aiming to eventually have the complete keyboard, headset and mouse collection (my review of the mouse will be ready soon). 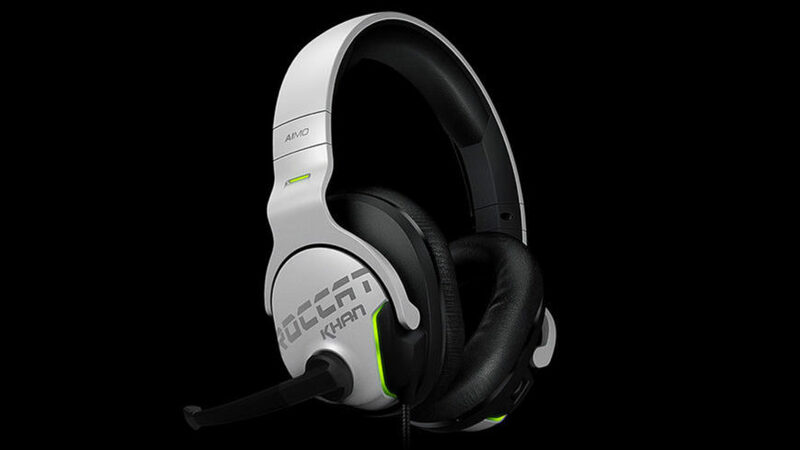 The Khan AIMO is a headset with a built-in DAC, offering virtual 7.1, 24-bit audio at a 96KHz sampling rate. The audio is driven via two large 50mm neodymium drivers, with a claimed frequency response of 10Hz to 40KHz, which in theory is far above and below the limits of human hearing. This massive over-specification is something akin to having Gordon Ramsay do your grocery shopping, but it’s also what allows the Khan to truly shine when it comes to audio reproduction. The microphone has a claimed frequency response of 100Hz to 10KHz, which covers the normal vocal range and more. RGB lighting is included as well (hence the AIMO in the name), and the 2.3m USB cable means you can move around quite comfortably without the cable being an issue. The first impression when putting on the headset is that it squeezes your ears quite tightly, but with the cups being made of memory foam they should start taking shape with extended use and offer a much more comfortable experience. Part of the reason it’s such a tight squeeze is due to the passive noise cancellation, and the Khan AIMO does a rather good job of blocking out background noise. 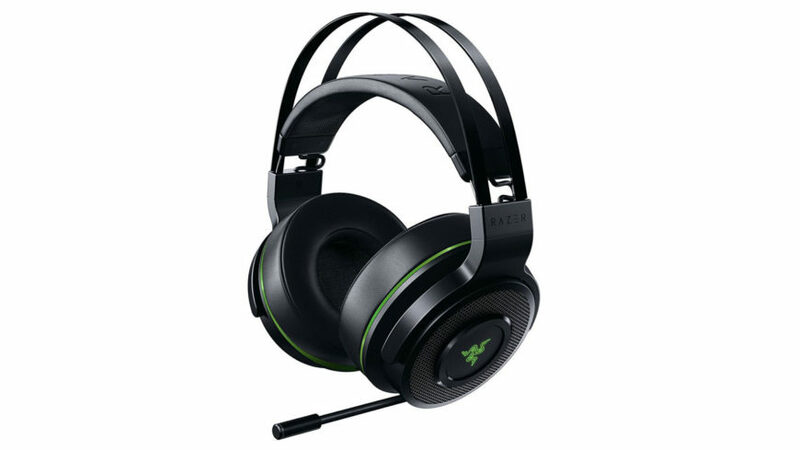 The headset is surprisingly lightweight compared to other, similarly sized headsets. This is a major positive, as it makes the headset a lot less noticeable with extended use, and also reduces neck strain. 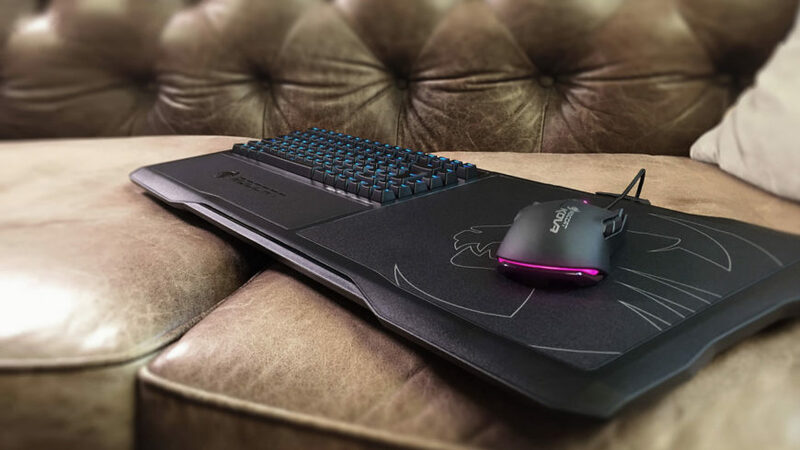 With many of the heavier options your neck will start taking some strain after several hours, and this alone is a major plus for the Khan AIMO. Visually, the Khan AIMO resembles a professional piece of sound equipment rather than a gaming peripheral (and the same holds true for the Khan PRO headset). The only thing that diverges from this design language and gives away its “gaming” credentials is the RGB lighting, which is a bit of an oddity (to me at least) and something that I will cover shortly. The microphone is of the non-detachable boom variety, but can be folded out of the way when not in use. There’s a slightly noticeable click as you raise the microphone – which was a bit disconcerting at first, but I soon discovered it’s actually a switch which automatically disables the microphone when it’s not in use. This is a neat feature, as a lot of alternatives require you to press a button to mute the microphone, regardless of its position. Being a USB headset, there’s nothing required to get going other than plugging it into an available USB port. 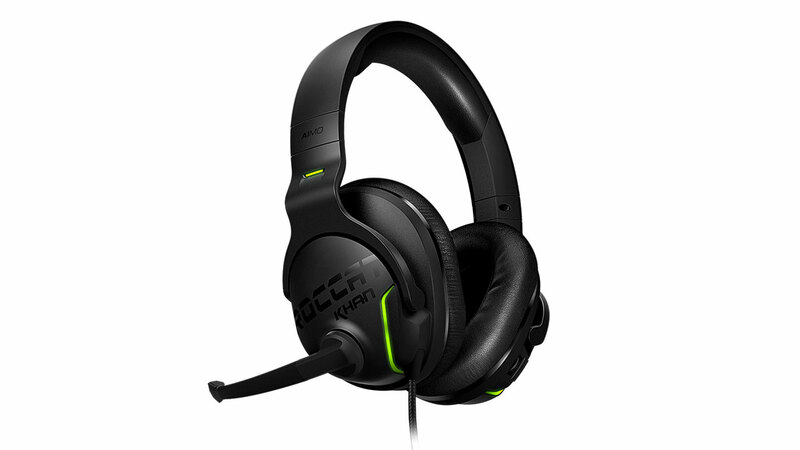 If you want to tinker with any settings, however, you’ll need to install the required drivers and ROCCAT Swarm software to adjust the RGB lighting (although this can be turned off with the press of a button on the headset, without any software required), play with the equalizer settings, enable the virtual 7.1 sound and more. Moving on to real-world usage, I played a variety of music, from classical and instrumental to pop, jazz and bass-heavy music, and was rewarded with crystal-clear sound throughout. Volume can be adjusted via a dial on the right ear cup, and while some might find this dial too small, it’s pretty easy to spin with a flick of your thumb. The bass is a little on the underwhelming side at its default settings, but that can be quickly and easily rectified by bumping up the low frequencies just a tad via the equalizer. This will come down to personal preference, and some situations (such as when listening to non-electronic music) really don’t need more bass than the out-of-the-box experience. In fact, songs like UB40’s Red Red Wine were perfectly enjoyable without a single adjustment being made. Maxing out the bass really brings it out if you want to feel the music, but it’s not quite the retina-shaking bass of some other headphones I’ve used. That said, regardless of how high I adjusted it, the bass remained surprisingly clear and didn’t become muddy at all. The higher frequencies are where the Khan AIMO really stands out. Tinny treble can get very tiring with extended listening, but with the Khan these frequencies are delivered in an unexpectedly precise and lively manner – an absolute pleasure to the ears insofar as USB headsets are concerned. I’ve used several headsets that offer punchy bass and fairly decent high-end (which might appeal to some listeners), but it’s almost always at the expense of the mid-range. On the Khan AIMO, this frequency range was just as clear, making for one of the most balanced listening experiences I’ve had – even compared to some of the lower-end studio-grade headsets out there. 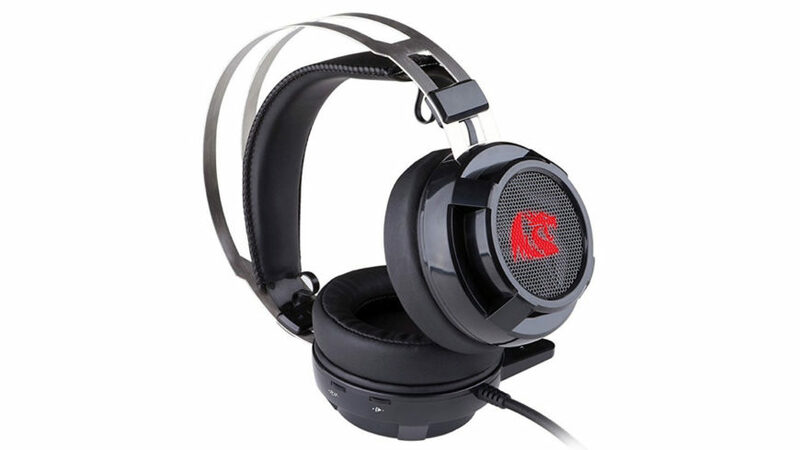 The stereo separation is rather aggressive, possibly due to the passive noise cancellation. At first, I actually spent the intro of a few songs wondering if both speakers were working. Led Zeppelin’s Stairway to Heaven was the most prominent example, with all audio coming from the left channel initially with no crosstalk whatsoever. But once you start hearing different instruments coming from different sides, it quickly becomes an immersive audio experience, and one which I will miss when I move on to other headsets. Coming back to the overall sound quality, I can’t stop harping on about just how good it is. This headset will enable you to follow each individual instrument throughout a song, to the extent that you’ll suddenly be able to hear notes that you previously didn’t even know were there. As for the gaming side of things, the audio positioning is brilliant, even without the virtual 7.1 surround sound enabled. 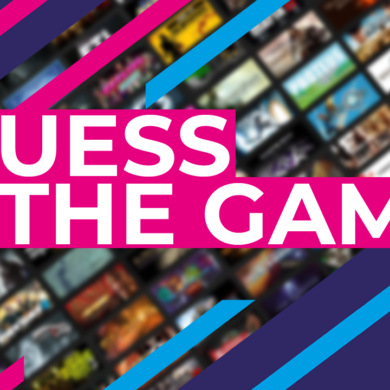 The direction and approximate distance of in-game sounds are easily discernible, even with your eyes closed. The microphone took me by surprise as well, with extremely accurate reproduction thanks to what ROCCAT calls “Real-Voice”. Listening to another person talking, both directly to me and via the microphone, was as close to indistinguishable as you’ll get. Other than being able to rotate the microphone out of the way when not in use, it can also be bent, albeit slightly, for more exact positioning. Once properly positioned, you can adjust it to be sensitive enough to pick up your mouse clicks, yet still avoid the sound of your own breathing. You’ll likely want to turn its sensitivity down in order to avoid background noise. Now let’s deal with the RGB lighting. This applies to all RGB-ified gaming headsets, but the most obvious question is: “Why?” It’s pretty much the only part of your computer you absolutely cannot see while in use, unless you sit in front of a mirror. I find this to be an absolutely unnecessary addition, and an added cost which could’ve gone into increasing the headset’s build quality a touch. Personally, I reckon faux-leather ear cups or a slightly more comfortable headband would’ve been a more welcome inclusion than RGB lighting. 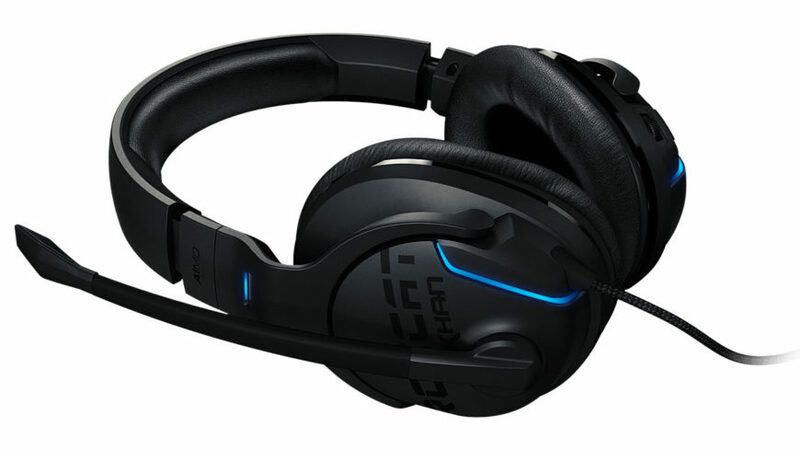 Given that the entire point of the Khan AIMO is the lighting though (or at the very least it’s a major selling point), I’ll concede that in some way, perhaps the RGB lighting is what’ll draw people to this headset – but it’s the audio quality that’ll make them happy they came. Ultimately, the lighting customisation (as on all components and peripherals which offer it) is really a matter of preference. As always, it’s rather difficult to rate something reliably based on a few hours or even a full day’s use, so the rest of this review is being written after using the headset exclusively for a full week. In a nutshell, I really, really like these. The memory foam has taken shape and I’m now mostly unaware that I’m wearing them. The sound quality has grown on me even more, and much to my chagrin I no longer enjoy listening to music on my phone nearly as much as I used to. This isn’t to say that they’re perfect. The headband is absolutely noticeable after an hour or two, although this is due to its design and not the overall weight of the headset, so it doesn’t put any strain on your neck. The ear cups also make your ears quite warm (almost hot, in fact) and they have the tendency to cause your ears to itch from time to time. These are fairly minor gripes when considering the overall package and the price you pay – but as is always the case with USB headsets that have built-in audio controllers, they’re of little to no relevance to those who’ve invested in discrete audio cards (or have high-end audio components on their motherboards) and insist on using them. If you’re buying it exclusively for use with a computer and don’t already have a sound card, the Khan AIMO is really hard to fault. It’s close to being at the top of the league in which its price range places them. 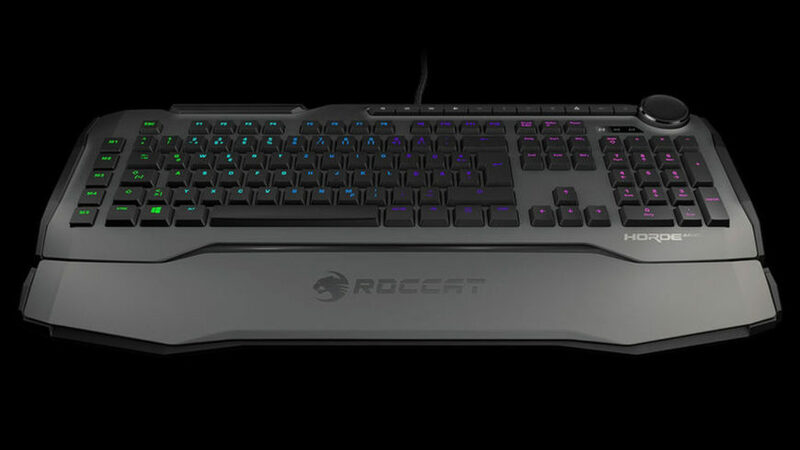 9ROCCAT has done it again, combining impressive audio reproduction with a sleek design. The price is on the high side, and as a result it’s got some tough competition from some mighty hi-fi audio sets. As far as USB gaming cans go, however, they are quite possibly without equal.